If your photograph appears here it does not infer that you should lose weight. 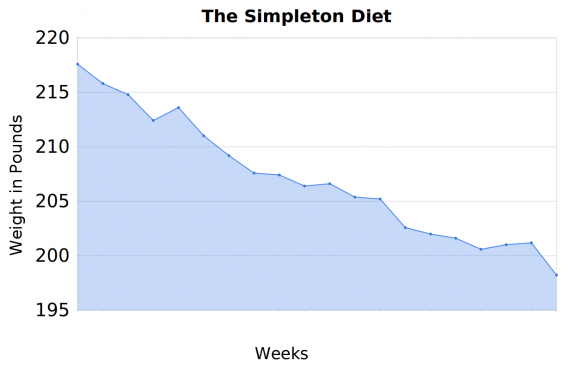 I have been asked by several friends to explain The Simpleton Diet. So here goes. Nothing. Money makes things so complicated, don’t you agree? Besides, nothing is about what it’s worth. How did The Simpleton Diet get its name? Download the spreadsheet (see below in the section called “The Simpleton Diet Spreadsheet”). To start, you fill in the blue box. All you need is your height in inches (used to calculate your Body Mass Index), the date you want to start, your current weight, and the what you want to weigh at the end of the program. What else do I have to enter? At the same time each week weigh yourself and enter your weight in pounds in the orange box. That is it, nothing else to enter. How is my weight loss goal calculated? Each week your new weight (hopefully lower) is used to determine the goal for the coming week. Your current weight is simply rounded down to the next whole number. So if you weight 195.7 pounds your goal for the next week is to lose 0.7 pounds. If it was 195.1 it would be 0.1 pounds. If it was 196.0 it would be 1.0 pound. The Simpleton Diet spreadsheet lists the key points of the plan. How can I lose a lot of weight if the goals are only in tenths of a pound? Most weeks you will exceed your goal and will lose over a pound. What should I do if I forget to weigh myself? Enter the same weight as the week before in the spreadsheet. The results are shown in the green box. The one of most interest is the total pounds lost. The average weight loss is also tracked. The most weight lost in a week is shown (as a positive number) and also the least weight lost (shown as a negative number if you gained weight). Weight loss as a percentage is computed and loss of Body Mass Index is displayed. The maximum you can weigh but still be in the BMI normal range is calculated. If you want to be right in the middle of the BMI normal range that weight is also calculated. A measure of someone’s weight in relation to height. To calculate one’s BMI, multiply one’s weight in pounds and divide that by the square of one’s height in inches. The Simpleton Diet spreadsheet has the BMI ranges listed. Do I have to eat special foods? No. Remember this is The Simpleton Diet. Special foods would make it complicated. How I am supposed to lose weight then? Use your current knowledge and some common sense. For example, people consume a lot of calories through what they drink. So drink more water. If you have a large meal in front of you, save half for later. Eat more salads. Snack on fresh fruits. To prevent boredom eating, compile a list of projects to keep you busy. Check the calories of what you eat and make needed adjustments. 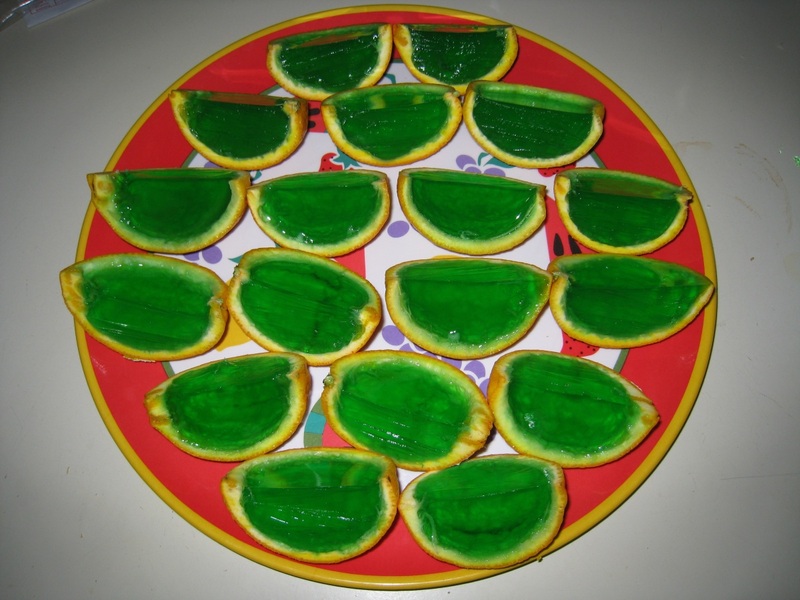 Most desserts don’t need to be eaten because you are already full. Yes, tell your family and friends you are on a diet so that you have an additional incentive to succeed. Oh, and eat hearty! 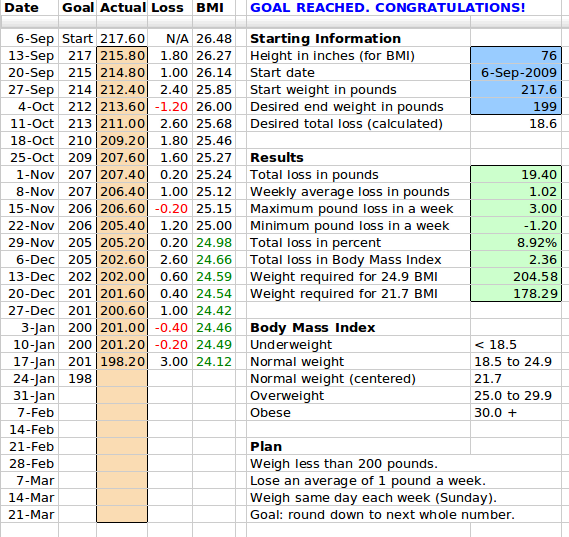 Below is the Simpleton Diet spreadsheet and chart I used to track my weight loss so you can see a real example. From it you can see my start weight was 217.6 with a goal to reach 199 pounds. At the time of writing (26 October) I have lost 10 pounds with a goal to lose 0.6 pounds this week. Notice that most weeks I have lost over a pound even though the weight goals were less. Here is the link for The Simpleton Diet Excel spreadsheet if you wish to download it and use it for yourself. Please tell me about your diet and your successes and/or failures. 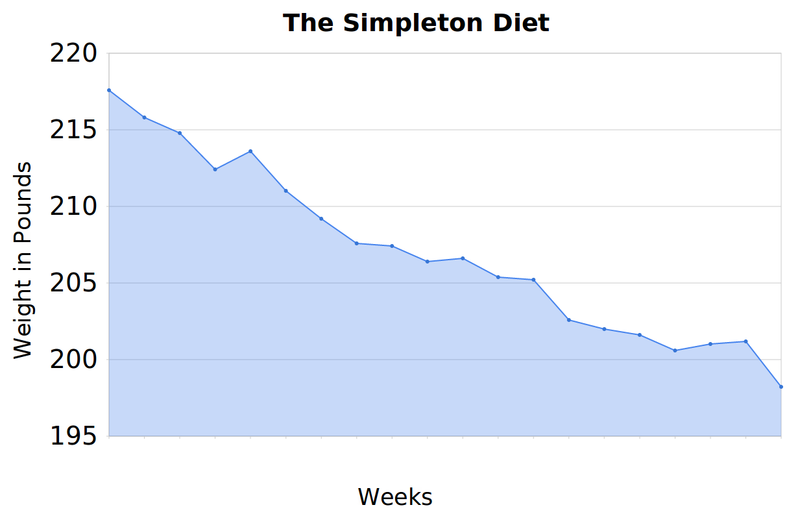 My Simpleton Diet results. Target weight reached. Each plot on the chart represents one week that corresponds to the weight entry in the spreadsheet. 1 Nov 2009 — Today I barely lost weight (0.2 pounds). This Halloween week the house was full of chips, sugary drinks and candy. At the beginning of the week I snacked on the chips and washed them down with Sprite. I ate some of the candy. Most of us are good at resisting temptation so long as it isn’t in front of us. Remembering that I would be reporting online any weight gains or losses, I quickly pulled my self together and exercised some restraint. 8 Nov 2009 — A one pound loss is right on target. This week I drunk more water instead of the soda I consumed last week. I ate a few Sun Chips instead of regular chips. I noticed my Quaker Granola cereal was a bunch of calories so I switched to Special K topped with fresh raspberries. 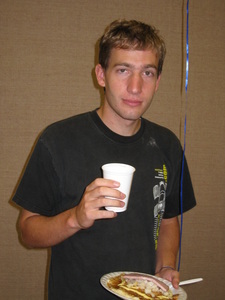 15 Nov 2009 — I ate a few too many snacks so no weight loss. 22 Nov 2009 — Even though I had a huge serving of fish, chips, and mushy peas at Little Taste of Britain, I still was able to lose. 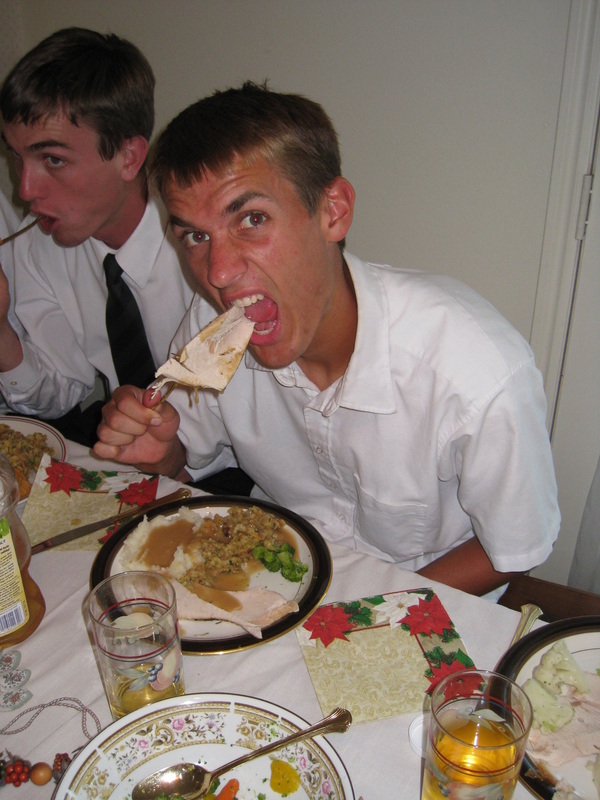 29 Nov 2009 — I was fortunate to lose a slight amount even though the hogs were at the Thanksgiving trough. 6 Dec 2009 — I was really focused this week. I either drank water, V8, G2 Gatorade, or milk. This helped a lot as many calories can enter via liquids. I am not a big dessert eater and there were no chips around to snack on. This 2.6 pound loss matches my previous highest loss. Just 3.6 pounds to go to reach my goal. 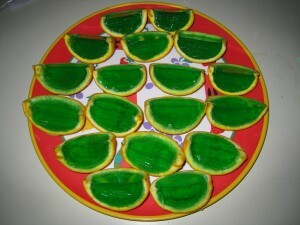 13 Dec 2009 — There are a lot of snacks around the house that didn’t help so even a small loss was welcome. 20 Dec 2009 — These small losses are still contributing towards my goal. Just 2.6 pounds to go. 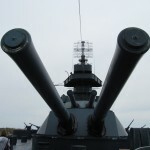 27 Dec 2009 — A satisfactory result for Christmas week. At times the snacking ruined my appetite which contributed to weight loss. Not the best way to lose a pound but I will take it. 3 Jan 2010 — A small gain. Chips should be banned from the house. 11 of Lay’s Wavy original chips rack up 150 calories. 17 Jan 2010 — I reached my target weight. I will continue to lose a little more weight but I won’t be posting any more results. If you are curious how I am doing, just ask. A few month ago I ate with three of my sons and my daughter-in-law. 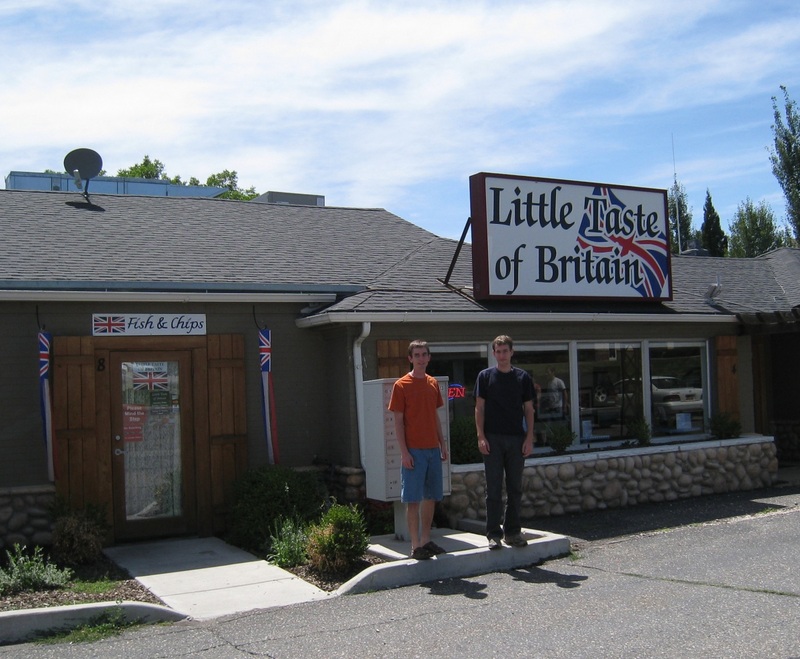 We descended on Little Taste of Britain in Layton (1095 N. Main). I was born and raised in England, emigrating to the United States at age 28 where I settled down and raised a family. So I was ready for fish and chips with mushy peas and maybe a drink of Vimto. The meal didn’t disappoint, the fish and chips were authentic — the large fillet of cod was battered and a deep-fried golden. Little Taste of Britain is run by Nick and Mandy Island. There is also a small market filled with British specialty items — everything from steak and kidney pies, bangers, English candy, and lots of other British imports. One customer drove all the way from Wendover just to try their fish and chips — and he wasn’t disappointed. Little Taste of Britain can be reached at (801) 543-5707. Fish and chips will run you $7.95 and I recommend adding mushy peas for $1.00. There are many other items on the menu. Utahns a bit peckish for little taste of English eats? 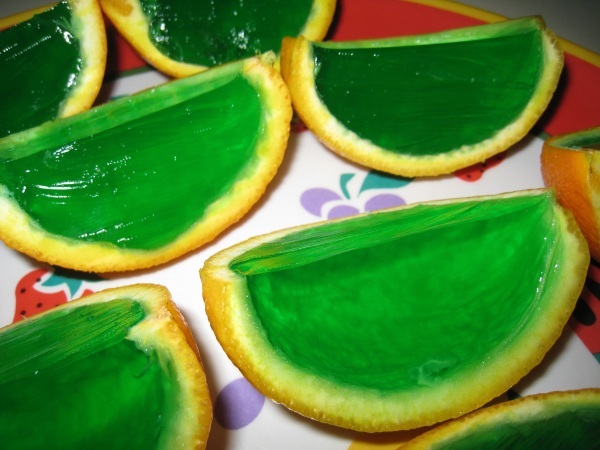 Cut the oranges in half and clean out the guts. Place the empty orange halves in 12oz. paper cups. Fill orange halves with Jell-O and refrigerate (use green Jell-O if you live in Utah). 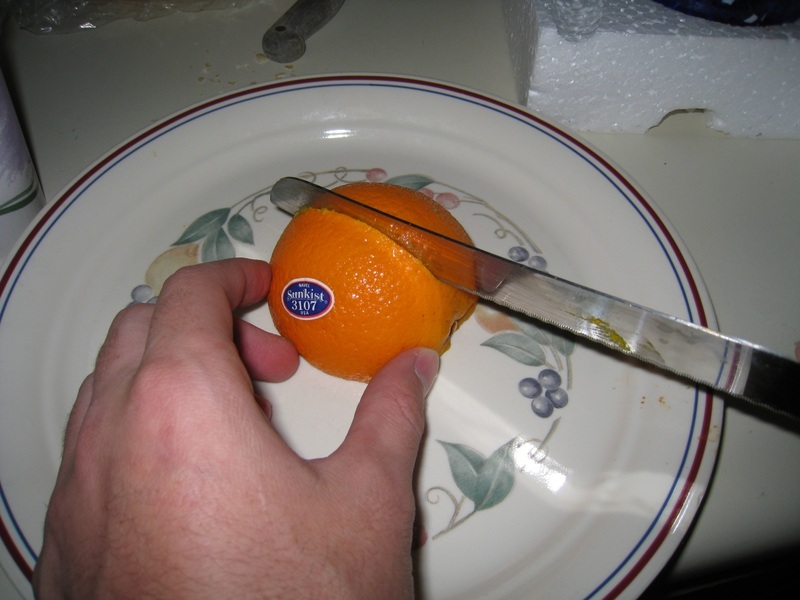 Place oranges face down and cut in half. Serve on a pretty tray. 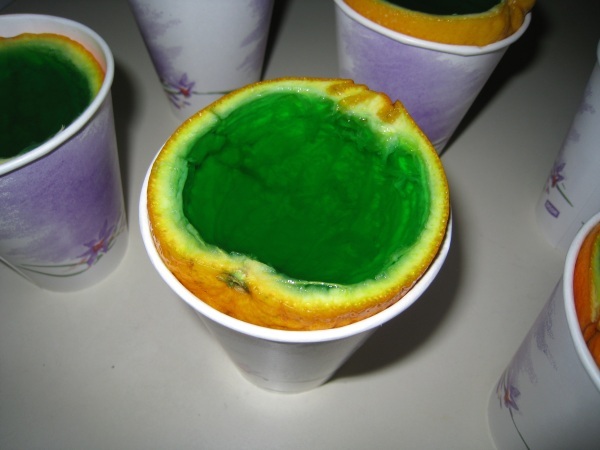 Jell-O is the official state snack food of Utah and apparently Utahns have the highest per capita consumption of Jell-O in the world. Daniel is leaving for the MTC in October and from there to Mongolia for two years. Jill decided to have a Thanksgiving meal for Daniel today because he won’t be with us in November. He’ll probably end up eating some unappetizing rickety meal on Thanksgiving Day. My assignment in getting the meal ready was to peel the potatoes. Because I was in the Army my children naturally think that I should be good at peeling potatoes. It turns out that I am but I didn’t learn the skill from my time in the Army. My family in England ate a lot of potatoes and that is where I acquired my spud abilities. Anyway I got away light because I went to help with some church membership duties. 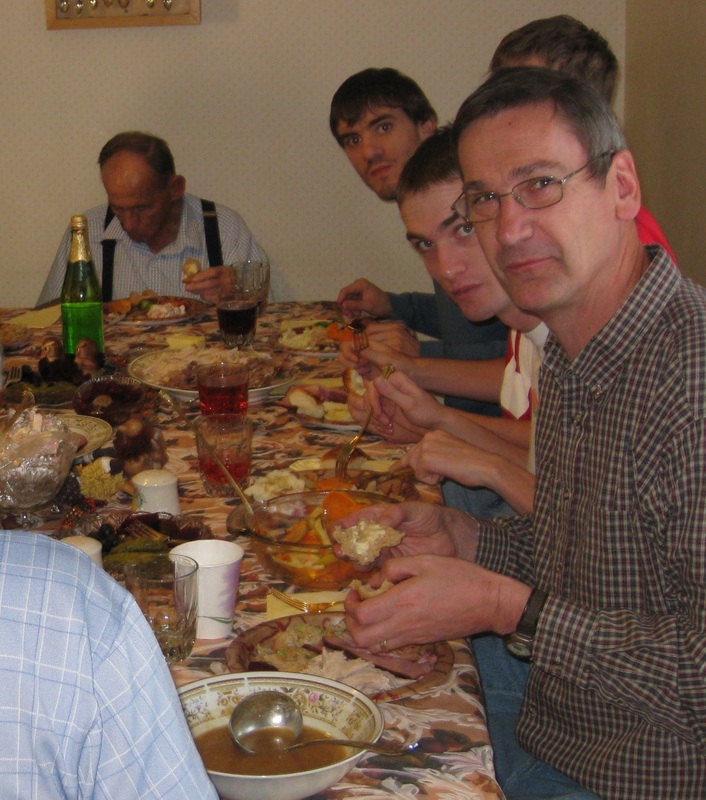 Daniel’s married siblings and their spouses joined in the feast. In the photograph above we have (left to right) Sarah, who is due in a week, Derek, Steven, Adelaide, Paul, Jake, Daniel, Rick, and Jill. All four of Daniel’s siblings were present. The meal was really good and the turkey was just right. Later in the evening we had a choice of pumpkin pie or cheesecake for dessert. I mentioned to Sarah that now that we have had Thanksgiving we don’t need to celebrate in November. She said, “O no, this is just for practice.” I want to point out here that I always ask that the potatoes be left whole but every time someone brutally mashes them. What do my readers think. Mashed or unmashed? We will miss Daniel. He is always cheerful and runs like the wind. He carried a few trophies home from his track events to the delight of his parents. He was elected Student Body Officer and made this great video for his election campaign. 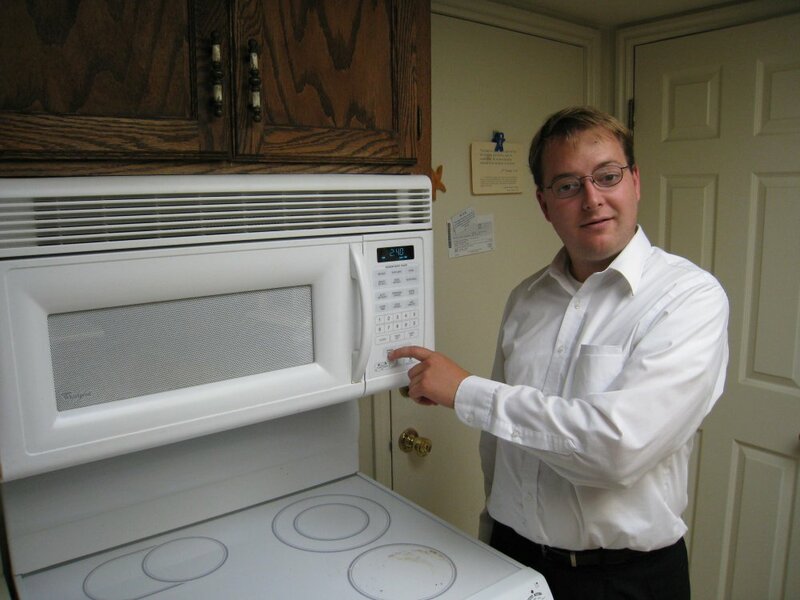 He diligently attends to his priesthood duties. He went out and got himself a leadership scholarship at the University of Utah. This type of behavior is a favorite with me because it potentially saves me a lot of money. But most of all he will be missed because for the last five years he has done the dishes and mowed the lawn! This morning Jill and I ate out. 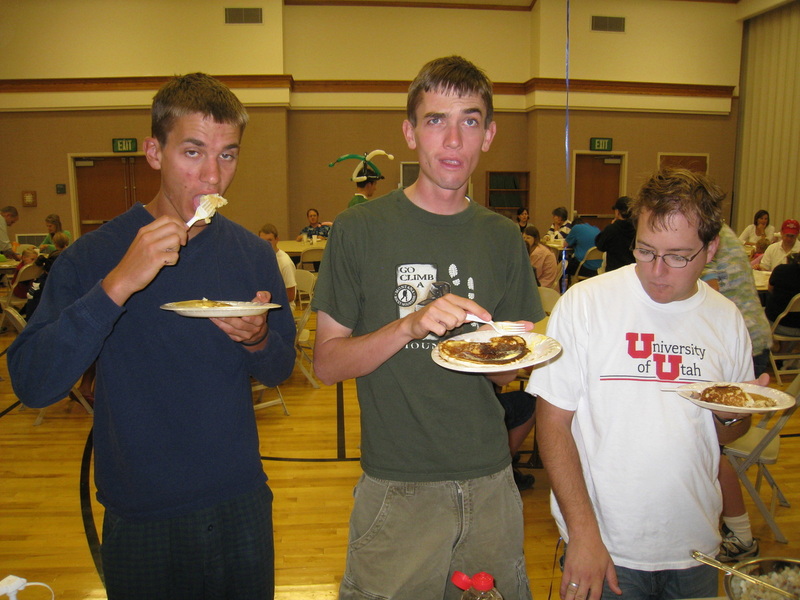 The Kaysville 14th Ward’s annual Labor Day Breakfast was in progress. There was only one menu but was it ever good. Bacon, ham, eggs, hash browns, milk, orange juice, and pancakes. It was raining so we ate in the cultural hall of the chapel. The cooking proceeded outside with two rickety canopies as a shield against the rain. The planned car wash was canceled because of the weather but the carnival items proceeded inside. There was cotton candy and animals made out of balloons, you’ve seen them, the long skinny kind. There were various games the children could play and win prizes. Jill and I just visited with friends for quite awhile. Our children, Paul, Jake, and Daniel appeared with Andrew for breakfast. Andrew got Paul out of bed and drug them all here to eat. In past years I have helped cook the breakfast but this year I took the day off. The rest of you enjoy your Labor Day — it’s back to work tomorrow! My family is fortunate to live very close to a home storage center. 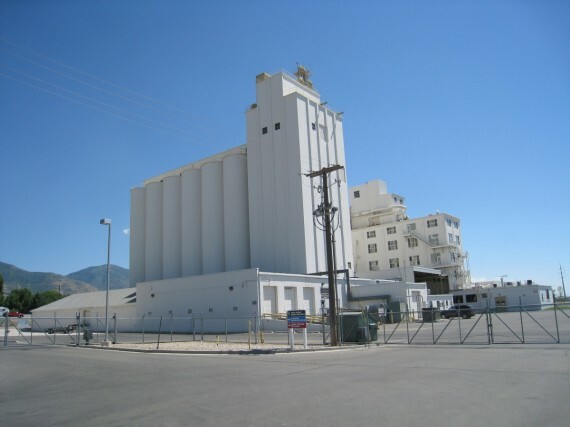 We live in Kaysville and the center is located at the Kaysville granary — you can’t get any closer than that! 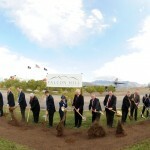 There are home storage centers located throughout the United States and Canada. We still refer to our home storage center as the dry pack cannery — same place, new name. Our home storage center assists my family with longer-term food storage like wheat, white rice, dry beans, oats, dried milk, and other basic food items. Our stake welfare specialist tells us when times are available at the center and we pack the food ourselves and purchase the items to take home that day. We go as a group and work together on everybody’s orders. We simply scoop the dried food into the cans, place a small packet inside to aid in sealing, and use a simple machine to seal the lid. Slap a label on the can and put six cans in a box and we are all done. It doesn’t take long to process even the largest orders. 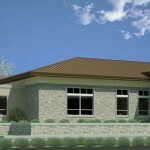 There is a home storage center order form available that we use to plan our purchases. There are prices listed on the form. We like to use our computer to enter quantities and the form automatically updates our total cost. We then print the form and take it with us to the home storage center. A sample from our storage: instant potatoes, sugar, rolled oats, hot cocoa mix, and apple slices. Our favorites are the fruit drink mix and the potato flakes. You really should try the potato flakes for they make the best mash potato you will probably ever taste. The dry onions work well in stews and the apple slices don’t last long if our children get a hold of them. Check out the storage life listed on the form. Most of the items are good for 30 years. By keeping out of debt and having an active food storage program our family has a peace of mind that allows us to enjoy life to the full. 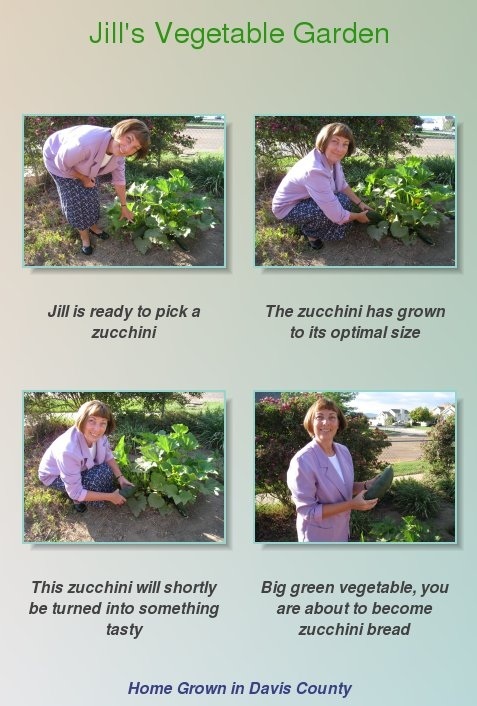 Jill has been growing a garden this year and she has done well with peas, zucchini, tomatoes, and peppers. I wanted to tear out our rickety swing set and plant corn but that was vetoed. What will I run my car on now? Gasoline?! The garden has done well with Jill’s new micro tubing watering system. 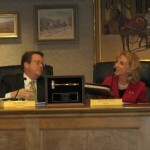 If you will recall, the system was featured on Serf Day where I helped to install it. Incidentally, Jill doesn’t generally garden in her skirt but it was Sunday and we still had one more appointment to keep. 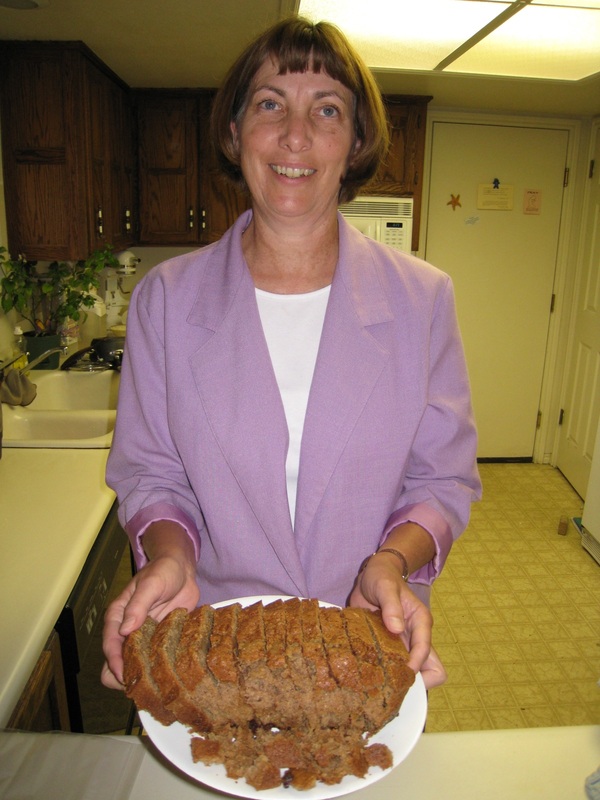 Here is what the bread looks like. Tasted really good too. Straight from the garden into my big fat mouth. In a previous post I showed how to make cheese and pickled onion sandwiches. Today I tell a story of a fishstick feast last week that almost ran aground. It began with a bag of Trident Seafoods Ultimate Fish Sticks made with whole fillets of wild Alaskan pollock — just makes your mouth water, does it not? As is my custom, I took four of these frozen fishsticks and began micro-waving them for 3 minutes exactly. 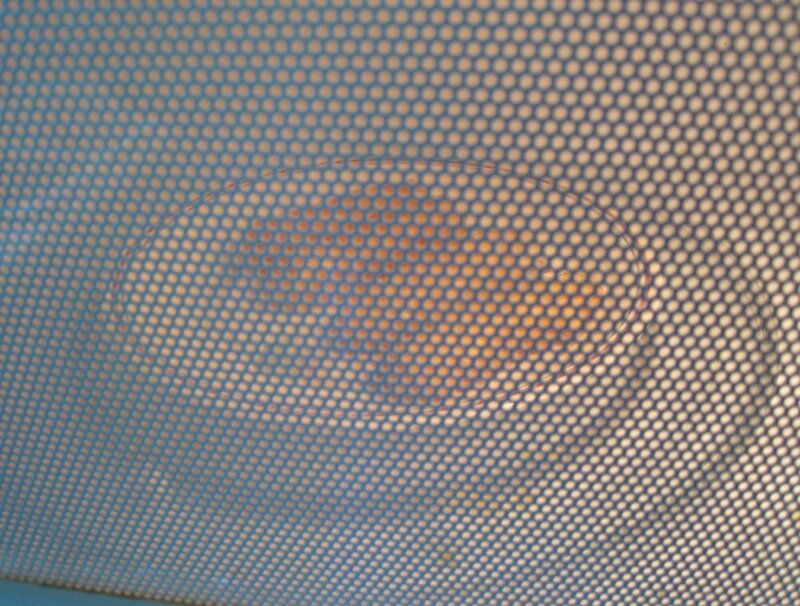 I was looking forward to my tasty meal and watched the micro-waves gently warm my morsels. With 1 minute and 40 seconds left, I had time for a last minute errand to the other room. After I left for just a moment, Andrew pushed the add one minute button to the recipe. The big celebration of Fathers Day took place yesterday. Kent and Susan invited all the fathers in the family for a meal of salmon, hamburgers, chicken, and hot dogs. 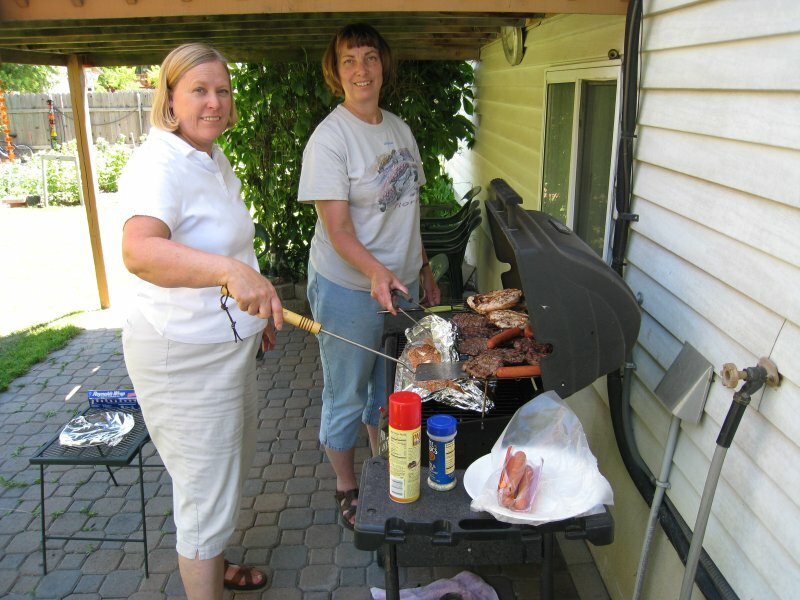 Here is Susan and Jill at the grill.